Having someone bring you a sandwich is typically recognized as a nice gesture. Who doesn't love a free sandwich, delivered? However, some folks in New Mexico may have mixed feelings on the matter right now, because someone has been dropping mysterious and very much unwanted bologna sandwiches on their doorsteps in the middle of the night. And they reek of urine. 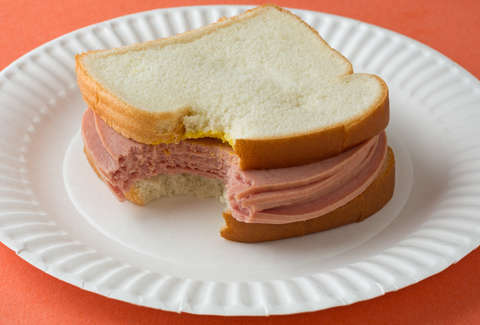 One neighborhood in southeast Albuquerque, New Mexico is currently being terrorized by a rogue bologna sandwich maker, who has been leaving grocery bags containing the tainted sandwiches on residents' door handles. It was initially thought to be an act of kindness, but was quickly determined not to be the case once people realized they all stank of pee. It's become such an issue that resident Sharisha Morrison actually set up a camera to try and catch the person who was doing it. She was successful in filming the perpetrator dropping off a bag at her doorstep, but no one seems to recognize him. What's more frustrating, no one has any clue what his motive could possibly be. "He'll always walk up from this direction, and he'll just walk up and drop it on the little doorknob and walk away, every single time that's all he does," Morrison said in an interview with KOB4 News. And while it may seem like just a slight and vaguely unsettling nuisance, it's actually driving some people to leave the neighborhood. "They're actually moving out because they're tired of it," Morrison said. Police have also reportedly stepped up their patrols in the area in hopes of catching the guy. So, uh, heads up to grocery store clerks in Albuquerque: Keep an eye out for some weird guy who's always buying lots of bologna. You could help crack the case.